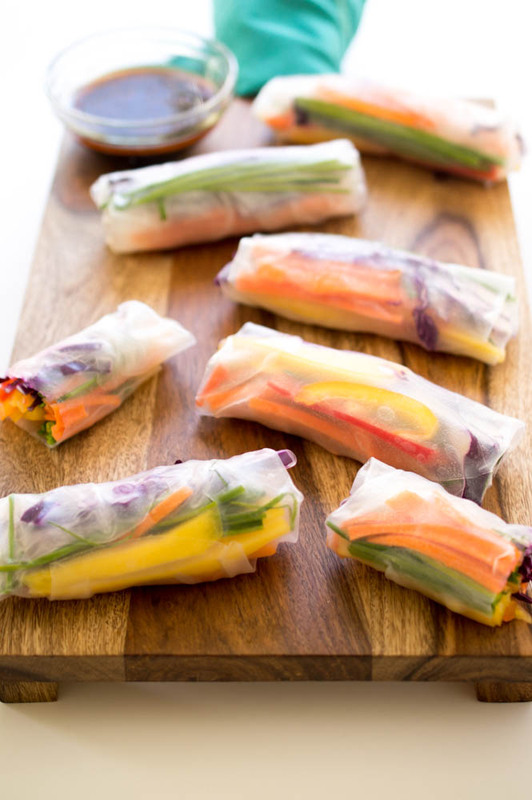 20 Minute Rainbow Vegetable Spring Rolls. Colorful and full of flavor. Served with a Sweet and Spicy Chili Sauce. Naturally vegan! After cooking all week the last thing I want to do on the weekend is cook. Therefore we end up eating out almost every weeknight. When I eat out I have to get the greasiest, cheesiest, highest caloric option. When in Rome right? Well when the work week rolls back around I try to hop back onto the healthy eating train. 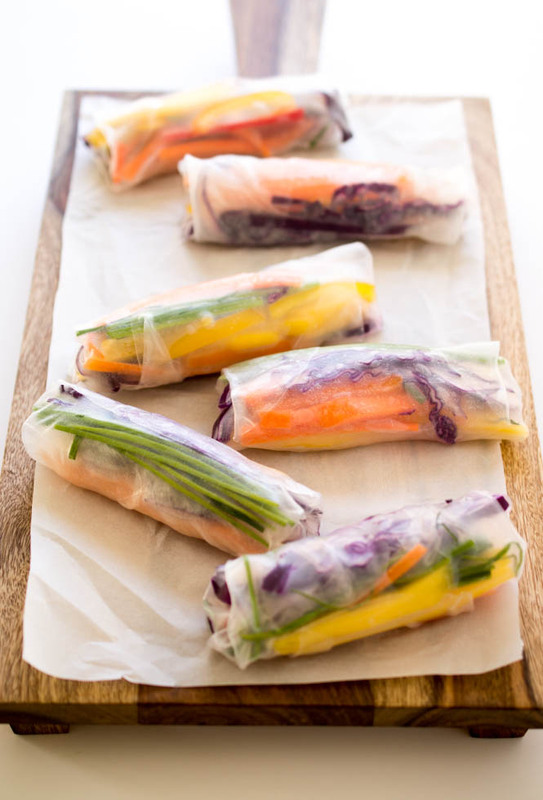 I started my week off with these Rainbow Vegetable Spring Rolls to help me get back on track. A healthy collection of fresh crisp veggies layered together in rice paper and served with a sweet and spicy chili sauce. 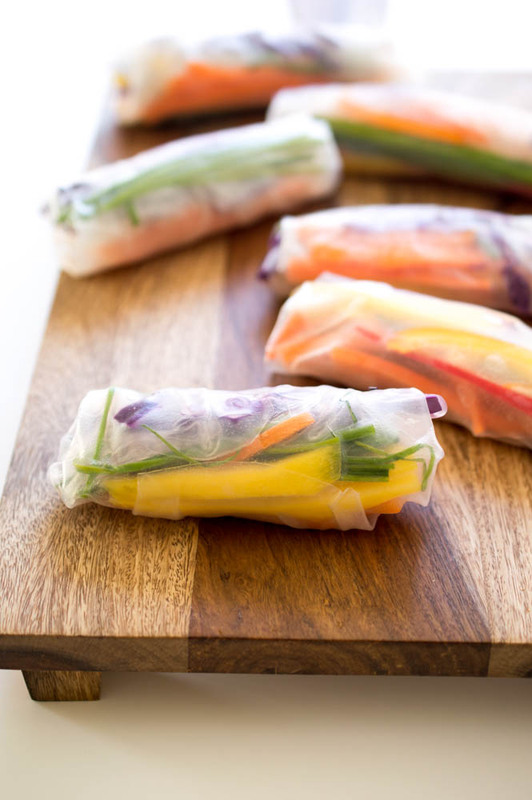 These nutrient packed springs rolls are the perfect way to detox after a long weekend. Fresh, crispy and full of vegetables. Beautiful, colorful and super crunchy. These are super fun to make. Perfect for lunch, dinner or as a snack. Add in your favorite vegetables. I added yellow, orange, and red bell peppers. Scallions, carrots, cabbage and my all time favorite mango were also added! 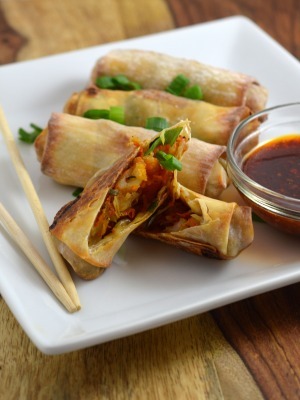 The spring rolls are paired with a sweet and spicy chili sauce that requires only 5 ingredients. No cook, gluten free and naturally vegan. You can find these rice paper wrappers at specialty Asian stores or online here. They make a wonderful lunch on the go. 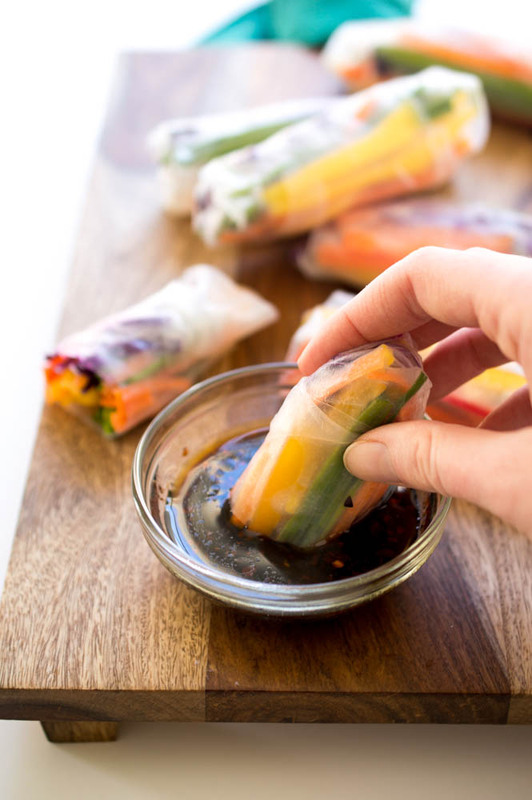 Chop up a few of your favorite colorful veggies and wrap in rice paper. It’s an easier appetizer than you think. A mandolin slicer can help speed up the process of slicing your vegetables. You can add steamed shrimp or tofu to these spring rolls if you prefer. Eat them on their own or dip them in this sweet and spicy sauce. Rice paper wrappers are easy to work with. All you need to do is place the wrapper in a bowl of warm water for 5-10 seconds until it softens up a bit. Place it on your work surface and add the filling in the top center. Fold the edge closest to you over the toppings and tuck the sides in and over the portion you just rolled. Roll forward making sure to keep the spring roll tight. Mango: High in vitamins C & A. The large amounts of vitamin C act as a great immune booster. Carrots: Loaded with antioxidants and a great source of Vitamin A. Bell Peppers: Packed full of vitamins and fiber. Also a great source of antioxidants. Scallions: Vitamin K and Fiber make this a good choice for the spring rolls. Also adds a great crunch and flavor! Red Cabbage: Rich in vitamins, fiber and antioxidants. 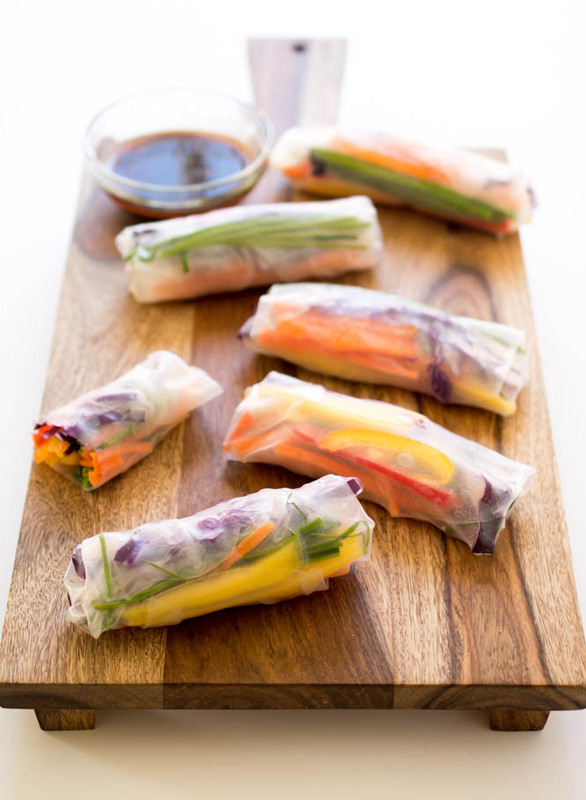 20 Minute Rainbow Vegetable Spring Rolls. Colorful and full of flavor. Served with a Sweet and Spicy Chili Sauce. Place 1 spring roll wrapper at a time in a bowl of warm water for 5-10 seconds until it softens up a bit. 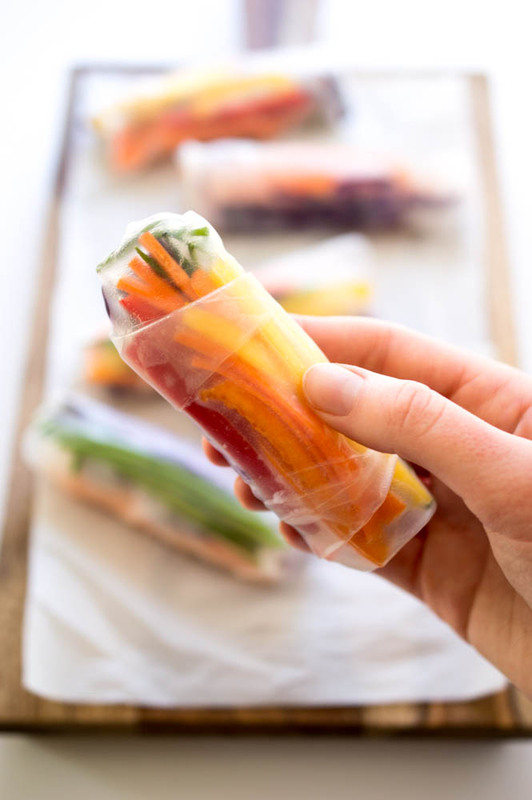 Place it on your work surface and add a handful of each veggie in the top center of the wrapper leaving enough space at the top to roll. (Do not over stuff) Fold the edge closest to you over the toppings and tuck the sides in and over the portion you just rolled. Roll away from you making sure to keep the spring roll tight. Repeat until you have used up all of the filling. Should make about 6 rolls. Serve immediately with the Sweet and Spicy Chili Sauce. Cover with a damp cloth so they do not stick together if you won't be serving them right away. Add soy sauce, chili garlic sauce, sriracha and honey to a small bowl. Slowly whisk in oil in a slow and steady stream. Serve immediately with the spring rolls. If the sauce separates give it a quick whisk. 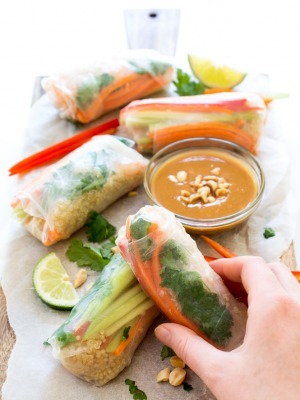 These spring rolls are gorgeous, Kelley! I’ve never made my own before, so I’m loving how easy this is to whip up! And that chili sauce sounds delicious. Pinned! 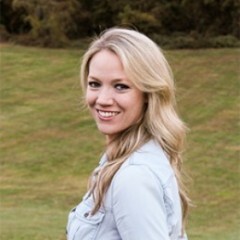 Beautiful AND healthy? What more could you ask for? This looks wonderful! I love how light and fresh spring rolls are. These look delicious! So fresh, colorful and delicious! Love the homemade chili sauce! Pinned! I’m the same way on the weekends, but by the time Monday rolls around I’m ready for some healthier food too! I love how fresh and vibrant these spring rolls look. They sound perfect for a light lunch! Those are so pretty and colourful! I love spring rolls, but haven’t made them for a long time. Need to do that again soon! these look delicious! and super pretty 😉 must try these pinned! I love how colourful these are. I have never made my own, but I am going to have to try. 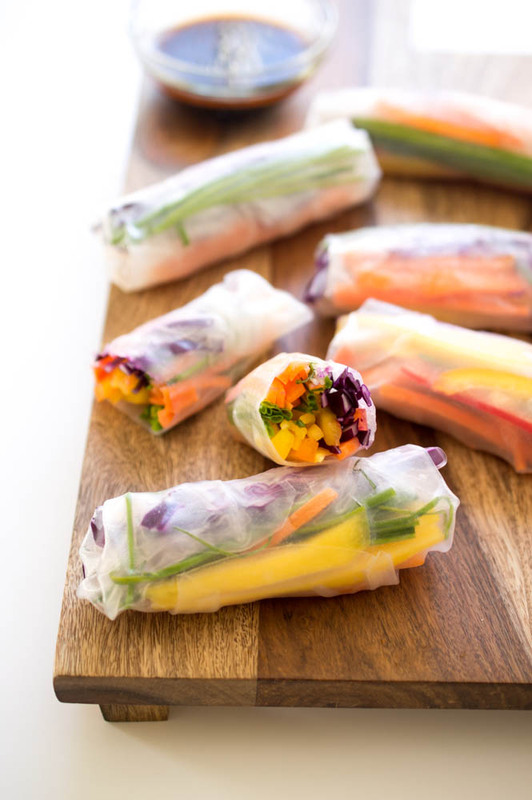 These veggie spring rolls look fantastic! I’ve never tried spring rolls before, maybe this would be a great place to start. Thanks for sharing. Wowz Kelley! These look so impressive, they are genius. They would go great for lunch/afternoon snacking 🙂 They’re surprisingly simple too. Hi! I made these this weekend and subbed avocado for the mango! super yummy! Just wonder what you think about how they would hold up to make ahead ? I am hosting a party and would like to make these the day before. Do you think they would dry out or get too gummy? It was funny how much more delicious raw veggies are when presented in such a pretty way! Thanks for any input! I would try making them the day of instead or making the day before. They do tend to dry out and become gummy when they sit for a while. I would prep all the veggies and chop them up the day before (that’s really the hardest part) and just put everything together the day of. Hope this helps! Love the idea of adding avocado. Will have to try. That is was my gut instinct too. Will get the prep done the day before and crank out the assembly that day. Just an FYI…the left over spring rolls hold up ok, a few small holes, but where the avocado touched the wrapper completely opened up. Either to acidic or too moist. The wrapper stayed nice texturally, not gummy at all. I would make ahead if I wasn’t going to use avocado, but that won’t happen! I love avocado! I would bet the mango would produce the same effect as the avocado. Thanks again for a yummy, fresh recipe! Thanks for the update Kelley! So glad they worked out well for you! I’m so confused, when does the shrimp go in? There is no shrimp in this recipe. You can go ahead and add it in with the rest of the ingredients if you want to add shrimp.